Thera Antifungal Body Powder, BUY Antifungal Powder, Antifungal Foot Powder, 116-BPA3OZ. 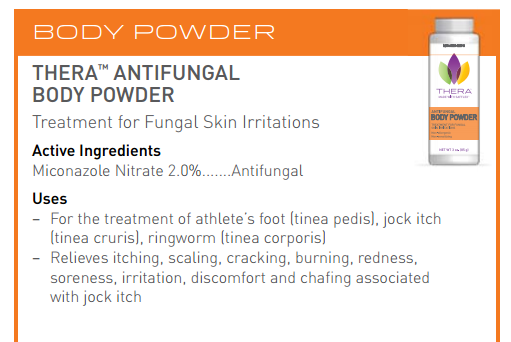 Thera Antifungal Body Powders, manufactured by McKesson, are designed to relieve the symptoms associated with fungal infections, ringworm, jock itch, and athlete's foot. This Antifungal Powder relieves: itching, scaling, redness, burning, cracking, soreness, and chafing. Unlike other Anti Fungal Powders, the Thera Body Powder is fortified with a blend of vitamins to help sooth and promote healthy skin. This Antifungal Treatment has a pleasant lavender scent. 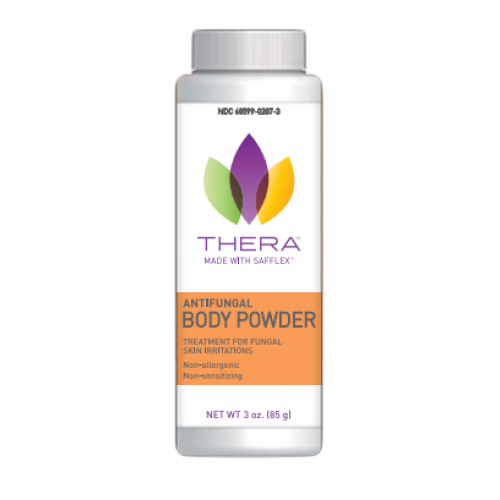 Thera Antifungal Body Powder comes in a convenient shaker bottle that allows you to apply the powder easily. This is especially important in the case of athlete's foot, because the spaces between the toes require a thorough treatment. To use for athlete's foot or ringworm, apply daily for four weeks. If using this product for athlete's foot, change socks once daily. To use for jock itch, apply daily for two weeks. Treats 7 symptoms of fungal infections. Treats three types of fungal infections. Contains vitamins to promote skin health. Thera Antifungal Body Powder Product Number: 116-BPA3OZ. Active Ingredient: Miconazole Nitrate 2.0%. While we typically recommend reading reviews left by customers, it's best to find some separate reviews from the manufacturer's site for some feedback. The manufacturer can also be contacted for any questions. Formula works well and bottle design perfect! I tried this brand and was not disappointed. I've been using anti-fungal body powder since I lived in Florida many years ago. It really helps prevent chafing & fungal irritations in warm weather. Highly recommend this one-- I especially like the design of the shaker bottle. This antifungal powder is favorable over the other brands, because it works just as good, but without hurting the skin.